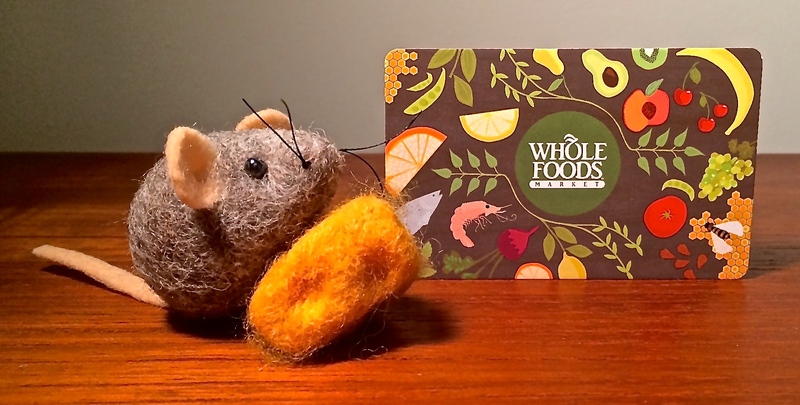 ← Free Cheese Nights at Whole Foods and Gift Card Giveaway! 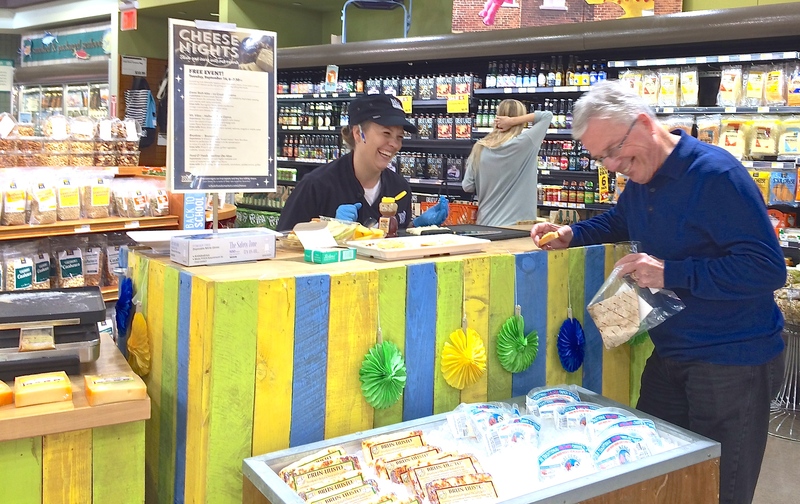 Hanging out with Whole Foods for Grilled Cheese Night and Gift Card Giveaway! 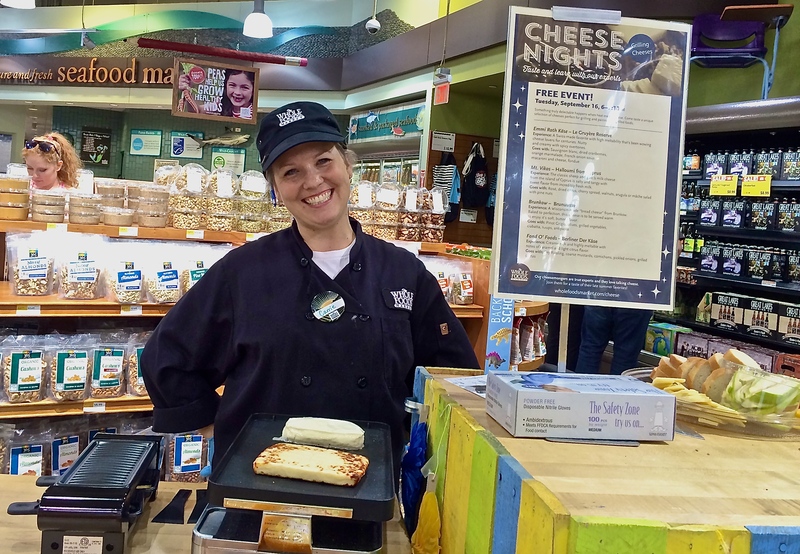 Hanging out at Whole Foods is always fun, but this past Tuesday night at the Ann Arbor-Cranbrook location was extra fun thanks to cheesemonger Carrie and her mad grilled cheese skills. Le Gruyère Reserve from Emmi Roth – a nutty, spicy cheese which melts great and is commonly used in fondue. This was grilled in a mini raclette and paired with sweet, tart Bartlett pears. Halloumi from Cyprus from G. & I. Keses – a combination of goat and sheep’s milk that takes the shape of the baskets in which it is made, this intense cheese actually does not melt at all! The salty cheese retains it’s shape and has a squeaky texture, but served with a drizzle of honey and it really pleased even the most discerning palate. Berliner Der Käse from Emmi Roth – a Whole Foods exclusive with a creamy texture and nutty taste grilled up nicely onto some baguettes. Carrie and the cheese were both big crowd-pleasers. So do you have a favorite fall cheese for grilling? We wanna know about it and it could get you a $50 Whole Foods Gift Card! Post a comment with your favorite Fall Cheese (Heck, you could even post a picture if you’d like!) by September 30th. A winner will be chosen at random and announced on October 6th. Thanks to Whole Foods in Ann Arbor for having me, Carrie putting up with me all evening, and good luck everyone! My favorite fall cheese is jalapeno cheese, great for making recipes for football parties! I like any style of goat cheese, the firmer the better; it is a great cheese, for any time of the year. Rhinette cheese is my favorite. Favorite Fall Cheese…I will go with a new one I’ve just discovered, Roth Cheese’s Moody Blue. There’s a hint of “burning leaf pile” in the flavor profile! smoked cheddar is my fave! I do like smoked cheddar. Comte, brie, smoked cheddar – We love cheese at our house. Most cheese! I like Provolone. My husband loved loved aged White cheddar. I love blue Valdeon with fall fruits like figs, peaches, and apples! Such a great combination. Blue cheese is my favorite. My kids love Parmesan cheese.